The early arrival of spring this year and an unusually small amount of snow during the winter have resulted in fires springing up at abandoned peat mines in the Moscow Region as early as late March. This year's early arrival of spring and the unusually light amount of snow in the winter have resulted in fires springing up at abandoned peat mines in the Moscow Region as early as late March. On March 29, a peat fire started at a drained peat bog in the region's Sergiyevo-Posadsky District when last year's dead grass was set alight. According to Emergency Ministry forecasts, the summer of 2014 may be quite dry. If there are still burning peat fires anywhere in the country by the start of the summer season, it will be impossible to avoid smoke pollution and the fire spreading to forests and residential areas. In an unfavorable scenario, over 7,000 towns and villages may end up in a potential risk area. It cannot be ruled out that Moscow too may be badly affected by smoke, just as it was four years ago. For Russia, the summer of 2010 became the hottest on record, with 22 temperature records broken in the course of three months. For a month, the day temperature in Moscow did not dip below 86 degrees Fahrenheit. In addition to the heat, there was hardly any rain: In July, Moscow saw only 0.5 inches of rain, compared with the norm of 3.5 inches. By the end of July 2010, a fire emergency was developing across practically the whole of west and central Russia: in the Moscow Region, as well as around Kirov, Tver, Kaluga, Pskov, and Yekaterinburg. Throughout the 2010 period of extreme weather and fires, some 60 people were killed and 2,500 houses burnt down. Fire damaged 134 villages, eight of which were destroyed completely. Some 40 years ago, following a long period of hot weather (with temperatures of over 95 degrees Fahrenheit) and little rain (just 5 inches of it all throughout the summer in Moscow and the Moscow Region), over a dozen regions in the European part of Russia were engulfed in fires, over 40,000 of them altogether. 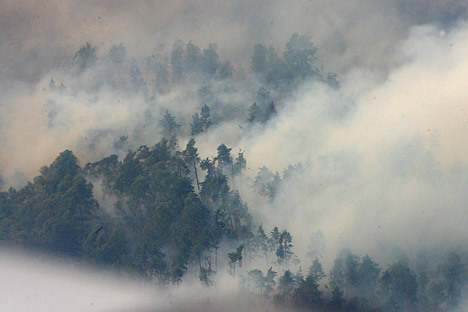 One of the worst consequences of peat bog fires is the resulting smog. In 2002, because of the smoke from peat fires, visibility in Moscow dropped to 50-300 meters. How much peat is there in Russia? The total area of peat bogs in Russia is 568,000 square kilometers. They are mostly located in the north of the European part of Russia, in Western Siberia and Kamchatka. Peat is a fossil fuel formed by marsh plants decaying in a humid and airless environment. Its main function in the environment is to accumulate carbon. In addition, peat also acts as a natural water filter as it absorbs impurities and heavy metals. Peat mining was at its busiest in Soviet times. In 1975, the USSR produced 90 million tons of peat, more than all the other countries of the world combined. Finland and Canada, the world's second and third largest peat producers at the time, mined just 1 million tons. Peat was used as a fuel in power generation and as a raw material in the chemical industry. In 1913, Russia built the world's first power plant running on peat. Throughout the time that peat was mined, it was also widely used in agriculture as a fertilizer for plants and bedding for cattle and poultry. However, with the development of the gas industry, the use of peat as an energy source was no longer profitable. The drop in demand resulted in a considerable number of peat mines being abandoned. The exact area they occupy is impossible to estimate, but it is certainly no less than hundreds of thousands of hectares. Peat can self-ignite at a temperature of 122-140 degrees Fahrenheit and humidity of under 40 percent. Peat bogs can smoulder all year round, even in the conditions least favorable for combustion. In 2002, peat fires in Russia were put out only during spring floods, as peat continued to burn even under snow. Following the fires of 2010, work to flood sections of once-drained peat bogs began. Flooding abandoned peat mines is one of the most effective ways of preventing peat fires. However, in most cases, fires are started through the negligence of members of the public who burn the previous year's grass in the spring or are just careless with fire. If a fire has not been prevented from starting, it is important to locate its sources as quickly as possible.